Coopersburg, PA (January 6th, 2019) – Just in time for fan season, lighting control manufacturer Lutron Electronics is announcing the newest addition to its Caséta smart lighting system. A new fan speed control provides wireless access to ceiling fans from anywhere inside or outside your home, allowing you to easily integrate a ceiling fan into your favorite Caséta scenes and schedules. Introduced in 2014, Caséta by Lutron is an easy to install, program, and use smart lighting control system designed to make every bulb smart. Today, it’s the most connected smart lighting control brand, working with popular products like automated shades, smart speakers, smart thermostats and voice assistants. The system is easily controlled via the free Lutron app and is backed by Lutron’s reliable Clear Connect Wireless technology. 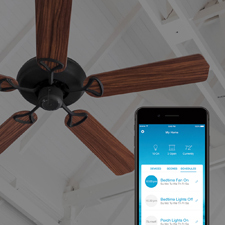 The highly-anticipated Caséta by Lutron fan speed control is easy to install and simple to set-up – making most ceiling fans “smart” and wirelessly adjustable within minutes. The fan control doesn’t require a canopy module and is easily added to the Lutron app, making it a quick 15-minute project. This flexible new control has four fan speeds with the ability to set a favorite speed setting. It is easily integrated into Caséta scenes and schedules using the Lutron smart bridge and app. A goodnight scene, for example, could now include lights turning off, shades lowering, and fans set to medium speed. For added convenience, control via Amazon Alexa, Apple HomeKit and the Google Assistant is also available. Matt Swatsky, Lutron Vice-President- Residential Mid-Market Business, anticipates builders will quickly add the fan control to their model homes. “Caséta by Lutron has been a popular choice with some of the nation’s largest home builders,” he said. “The new ceiling fan control paired alongside Caséta dimmers, switches, and Pico remotes provides a clean, coordinated look throughout the home,” he said. For times that you don’t want to use your voice or app to adjust a fan, add the new battery-powered fan Pico remote to your system for wireless control inside the home. Ideal for nightstands, coffee tables and anywhere three-way control is needed, the fan Pico has a 30-foot range, a (typical) 10-year battery life, and multiple mounting options. Available in white, ivory, light almond and black, the fan control is compatible with a single 1.5A ceiling fan and requires a neutral wire for installation. The Caséta by Lutron fan speed control and fan Pico will be available in March at select home improvement centers, online retailers, electrical distributors and from your local electrical professional. Suggested list price for the fan control and fan Pico is $80 and $42, respectively. For customers needing installation assistance, a network of Lutron-certified PRO installers can be found on lutron.com. Founded in 1961, Lutron Electronics is headquartered in Coopersburg, Pennsylvania. From dimmers for the home, to lighting management systems for entire buildings, the company offers more than 15,000 energy-saving products, sold in more than 100 countries. In the US alone, Lutron products save an estimated 10 billion kWh of electricity, or approximately $1 billion in utility costs per year. The company’s early inventions— including the first solid-state electronic dimmer invented by Lutron’s founder, Joel Spira—are now at the Smithsonian’s National Museum of American History in Washington, DC. • Amazon, Alexa and all related logos are trademarks of Amazon.com, Inc. or its affiliates. • Google is a trademark of Google Inc.